Look For What You Want To See | Dream Big – Make a Difference! I’m starting Week 3 of my Boston Marathon training for Samaritans to raise money to save lives and create awareness towards suicide prevention and mental health illnesses. So far the weather has been great – I hope it continues all winter! As I ran this week, I was thinking about challenges and obstacles that so many face. Guess what I found everywhere I looked? Yep, challenges and obstacles. Every step seemed to find another gotcha, warning, and hazard, all filled with risk. My negative thoughts compounded, turning into doubts and fear, and made me want to turn around. Our brains can work either for or against us. When we shift our thinking to positive thoughts, our minds can be our greatest asset that keep us going and stay motivated! As you read my alternate responses below for each picture, see which ones make you feel stressed versus relaxed. Which make you want to run versus stop in your tracks? What is your typical reaction? In the week ahead, I ask that you reflect on your reactions to all things. Think positive thoughts and get some upward spirals started today! 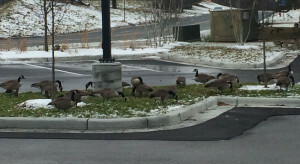 Initial negative thoughts: Aaah, a gaggle of geese! They could turn on me at any moment! Why are they looking at me? 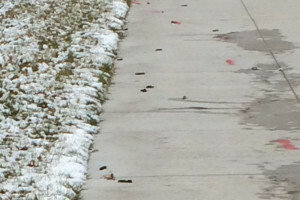 And why are they so spiteful to do this to the sidewalk? Positive thoughts: Look! An obstacle course that will help me strengthen all sorts of muscles in my legs as I dart back and forth. Thank you for waking my brain up as I have to pay attention to the road in front of me. 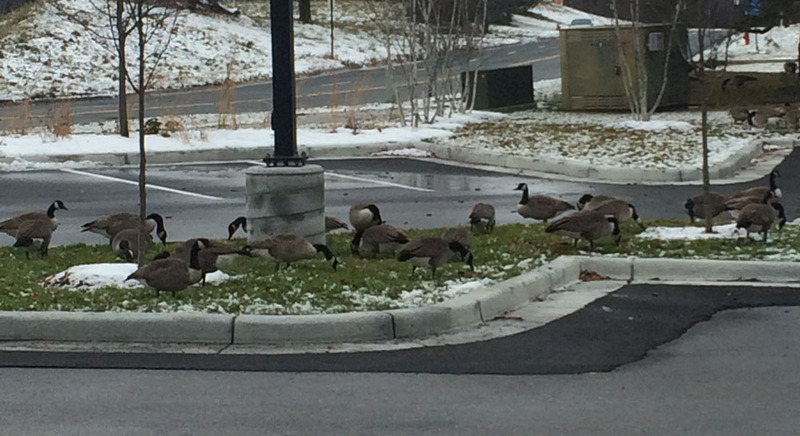 So cool to see animals that will brave the outdoors with me all winter long! 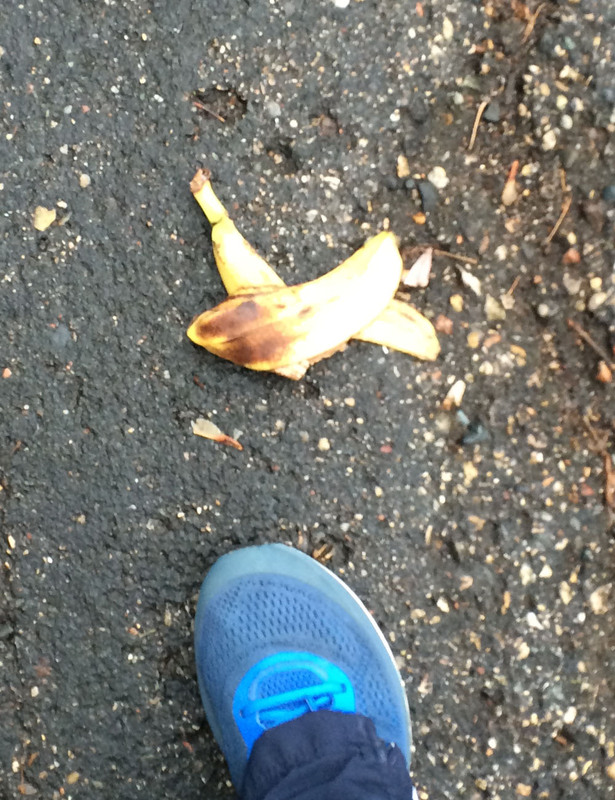 Initial negative thoughts: Seriously, a banana peel on the side walk?!?!? One false step and I’ll be flat on my back! How could someone be so inconsiderate? What a mess!! Positive thoughts: Wheee – I could slide down this hill! Soon I’ll be home and can refuel with fresh fruit! This peel will compost and give life to so many critters. 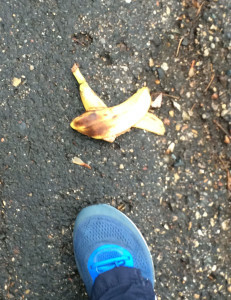 Ha ha – had some good laughs watching MythBusters fall on banana peels. Initial negative thoughts: A knife on the sidewalk? Seriously? How did this get here? What if I fell on it? Was it part of a crime? Kids causing trouble? What kind of neighborhood is this? Positive thoughts: You can’t make this stuff up – I’m in awe of how well the universe listens. 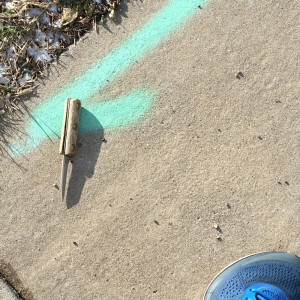 I start thinking about danger and the next thing you know I’m jogging over knives! My mind has incredible power, and I need to use it conjure up money next time! And make sure I keep it focused on helping others and spreading encouragement to all. 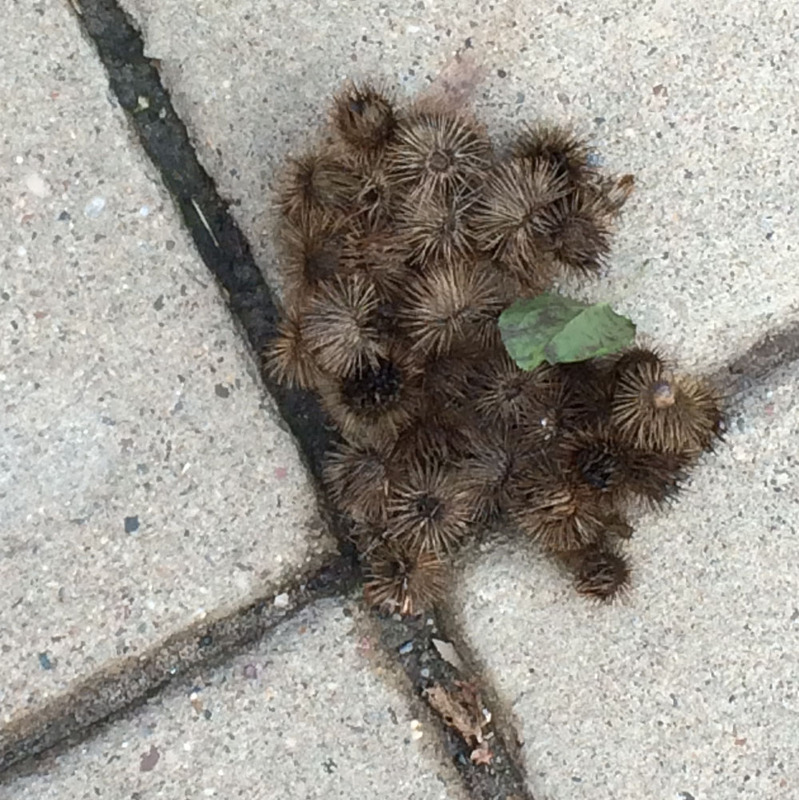 I jogged over this giant ball of thistles many times. As I started thinking about challenges I got this great thought to take a picture of it in my hand. The thistle called to me. It beckoned me and played me its Siren Song. How much trouble could it cause? Initial negative thoughts: Are you for frickin’ real? Seriously, I just want a picture for my blog and you attack me? I’ll be picking thistles out of my gloves and shoes for weeks? 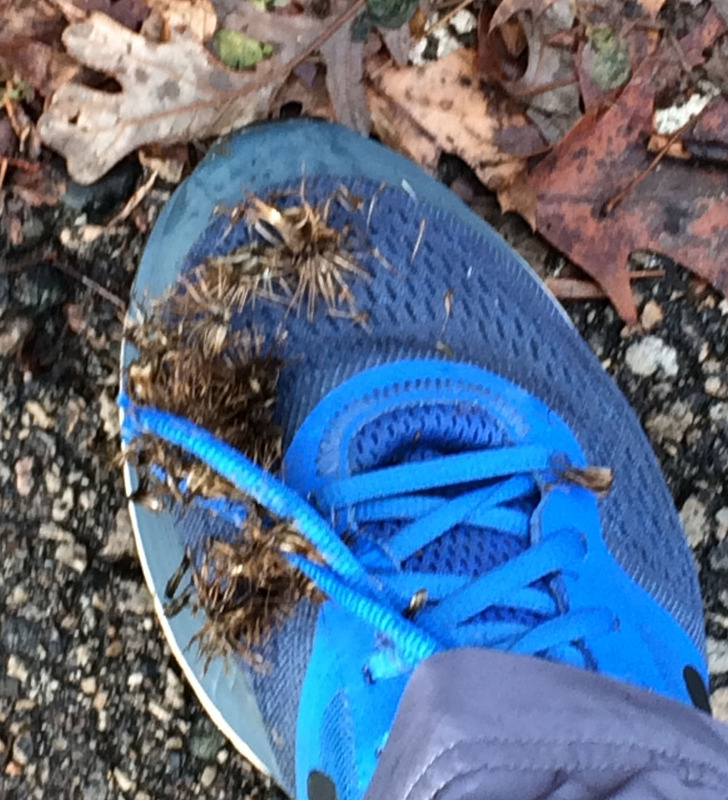 Crap – I shook my hand and now I’ve got thistles on my shoes, socks, pants and glove! I’ll get splinters in my feet? I’ll cut myself when wiping my nose now with my gloved hand. 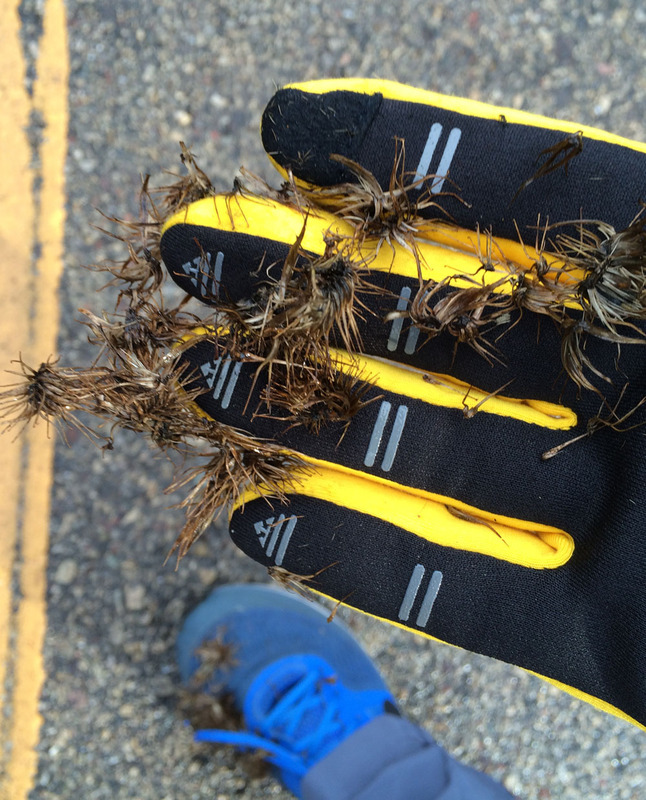 The more I rub my gloves together the more thistle parts are everywhere and they don’t come out! Positive thoughts: I can’t lie, my initial reaction was a bit of shock and a few seconds of frustration, but if you would have been driving by you would have almost immediately seen me laughing and talking to myself. It was a riot to see how fast I got covered in these things. Wow – nature, you impress me! Is this similar to the story that inspired the invention of velcro? 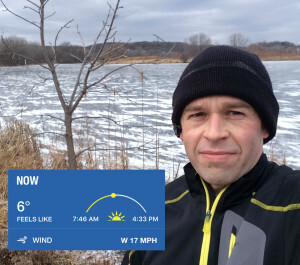 Ok, I got myself into this, now I need to get myself out of this – one burr at a time – how can I best apply this to helping others get through their struggles? The same way – we’ll get out of it together, one burr at a time. Initial negative thoughts: Unstable ground? I could twist an ankle in Week 2 of training. 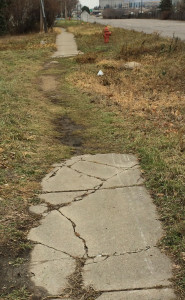 What’s the matter with this neighborhood – fix your crappy streets! 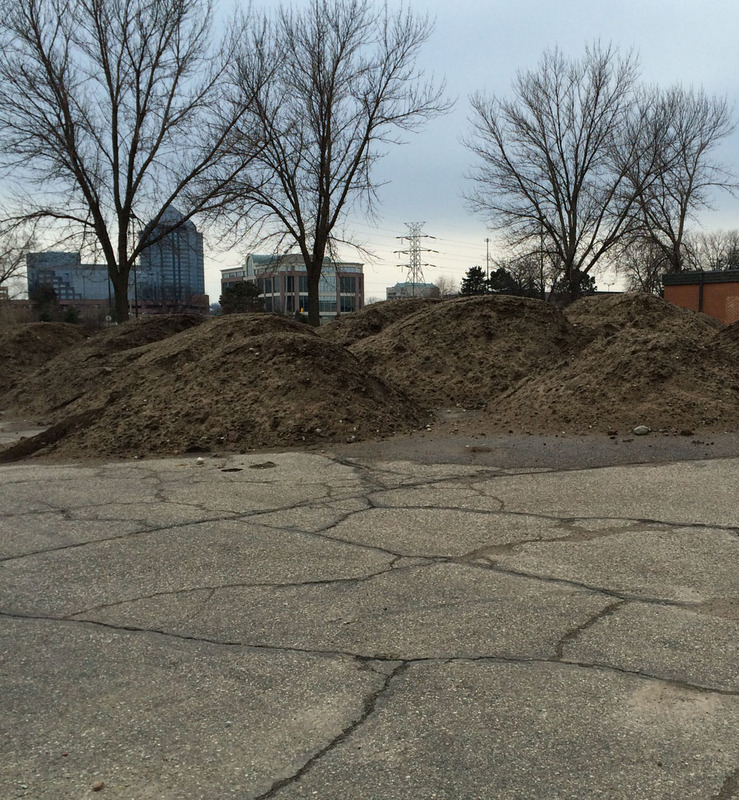 Am I making mountains out of mole hills? Why would you put your dirt here on this area of town that already has no sidewalks. Positive thoughts: More paths to make my knees and ankles stronger, keep my body guessing, and give me power. I always stay more engaged on unpredictable terrain. Thank you city for saving tax dollars and creating a fun run for me! What did I learn this past week? Reminders once again that the universe listens. We create opportunities (or obstacles!) by what we’re already looking for ahead of time. If you start taking steps (even small ones) and think positive thoughts, you will see things in a positive light and be happier. Our emotions are created by how we interpret everything. We can have fun and learn in every situation around us, but we have to be open to new experiences. 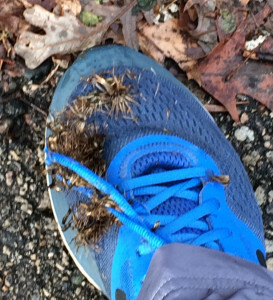 Be kind to yourself, believe in what’s possible, and think happy thoughts (regardless of how many burrs just attacked your hand), and your challenges will start to go away! In the weeks ahead, practice being positive regardless of what you’re facing, and support and encourage those around you! This entry was posted in Boston Marathon, Live life more fully, Mental Health on December 22, 2015 by dcthmpsn. For three and a half years I dreaded to see a dark blue Jeep Liberty like Katherine’s as I drove (negative thoughts). A lady I work with, who lost her mother last year, told me she enjoys seeing a red cardinal because her mother liked them so much. When she sees a cardinal now it gives her a chance to “talk” with her mother and let her know everything is fine. Now, I look forward to seeing a Liberty like Katherine’s as it gives me a chance to say “hi” to Katherine and tell her how much I love and miss her. Positive thoughts do make a big difference!